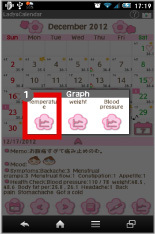 This is the calendar that you can manage the cycle of menstrual period and basal body temperature. 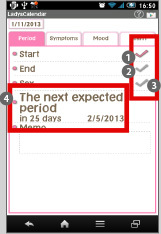 By registering the date of the cycle of menstrual period, menstrual period, expected menstrual date and increased probability of pregnancyand highest probability date will appear on the calendar. 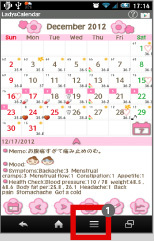 This calendar shows your health condition at a glance and can save memo too! New function "Export Cloud" for backup is added now! Please check below the description how to do it. 2013.03.27:Added a new function "medicine name" in Setting. When changing names and contents of medicines after saving them, untick the checkmark for not reflecting the modifications to the past data. Added an average bar on the graphs (charts). Please check the description below. 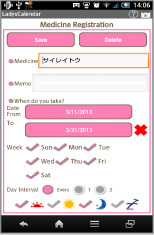 2013.03.24:Renewed the tag screen and medication management is available now. Please check the description below. 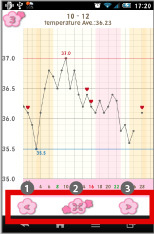 2013.01.07:Added a period cycle to the graph (chart). Added Mood and Symptoms to the graph. 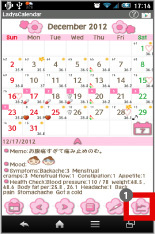 2013.01.02:The app design was renewed! 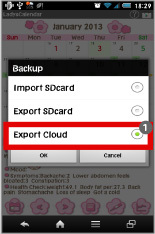 New function "Export Cloud" for backup data is added now! 2012.03.13:Made a modification about password function. 2012.03.13:Added a new function. Tap "Graph" button →　Press "Menu". You can send the graph by email. 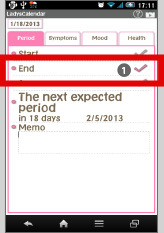 ❶ 「BaseSetting」：Set and edit your menstrual cycle and period. 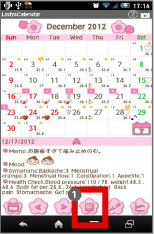 ❸ 「Mark」：You can add marks on each day of the calendar. 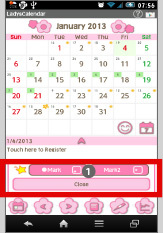 ❹ 「Setting Mark」：You can customize the list of marks. -----Import SD card: Import data from SD card. -----Export SD card: Export data to SD card. -----Export Cloud:You can backup data to Google Drive and Dropbox.＊Please install either software from the market. 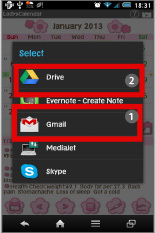 「Copy to SD card」：Copy the data to internal and external SD card. The opening screen is "BaseSetting". 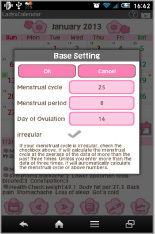 Register menstrual cycle andmenstrual period. 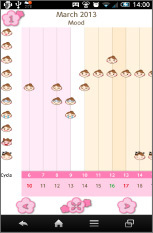 ＊Ovulation is calculated 14days from the next expected period but this is just rough indication. Please see this as aguide. Today: Go back to today's date. Left＆Right：Move dates right and left. 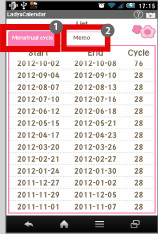 List: The monthly cycle of period appears in the list. 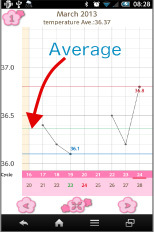 Basal Body Temperature: add your temperature on the calendar. Graph: Check the alteration in temperature. "Weekly": Swith the calendar to weekly display. Green's background is today's date. 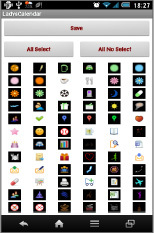 Select (tap) a day of the start of period, then tap here. Move to "Period" tag. Pink tag is selected one. 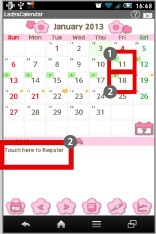 Tick the checkmark and press "Back" button of the mobile phone to save and return to the calendar. The end of the period can be saved in the same way. Tick here then a heart mark will be appear on the date. Here it shows the next expected date and the remaining days. 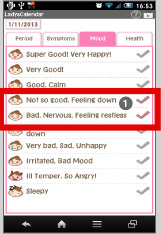 Tap symptoms then tap "Mood" tag. Tick the checkmarks of the days's mood. Tap conditions of the day. 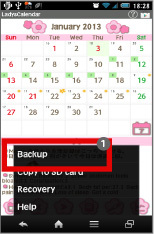 Press "Back" button of the mobile phone to return to the calendar when you finish the entries of all the data. 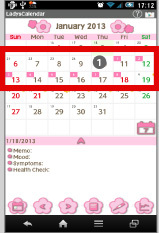 When you save the start day of the period, the small square mark on the date will change the color from green to pink. 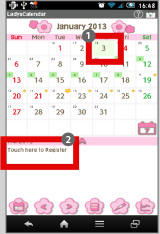 Select the end day of the period and tap the place "Touch here to register". 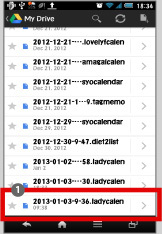 Tick the checkmark of "End" and press "Back" button of the mobile phone to save and return to the calendar. The period that finished shows with pink square. "Menstrual cycle" tag is selected. You can see the list of the past period log here. Tap the arrow here to see the saved content. 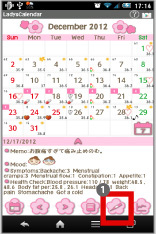 Press "Back" button of the mobile phone to save and return to the calendar. Tap this button to save basal body temperature. Pink background is the period you had. Orange background shows ovulation period. Switch the graph from 1,3,6 and 12 month. Move to the previous month. Expand and shrink the graph. Move to the next month. Press "Menu" button of the mobile phone. Please check the description of each menu button above. Select here "Mark". "Mark" button was added to the latest version! You can add marks on the calendar by using this button too! You can add 2 marks each day. Tap mark button to see the mark list. Select "Mark Setting" from "Menu" button of the mobile phone. The mark list. Select the marks you want to use. You can customize the list. Tap "Menu" button of the mobile, select "More" and then select "Backup". Select "Export Cloud" and tap "OK". Select an app from the list to backup. Select "Gmai" and send the data to yourself. The data will be sent as an attached file. 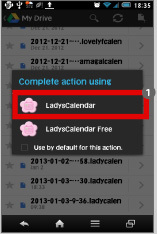 Open the attached file and select LadysCalendar to retrieve the data. Select "Google Drive". Please download and install either software from Google Play. It shows here the file name of your data. You can change the name. Tap "OK" to start uploading. 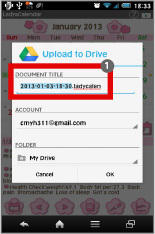 After uploading, launch Google Drive and select the file name. Select an app from the list. Completed retriving the data. It is very simple and easy! 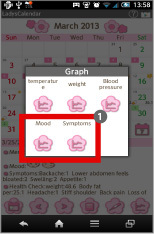 Mood and Symptoms chart are added to the new version! This is the Mood chart! Renewed the tag screen design! Now you can manage your medications! Medicine tag. When there are medications saved, it shows like this image. 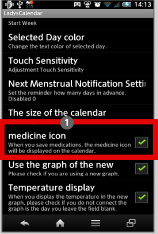 Tap this button to save medicines! Enter and save the name of the medicine, When you take them, Interval and set the alarm. Save with "Save" button and return to the medicine tag. Tap this List button to see the list. This is the list image when you saved your medications. You can change the sort by press-and-hold! Press-and-hold to change the sort! Very simple! 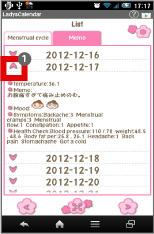 When you save medications, a pill mark appears on the calendar. 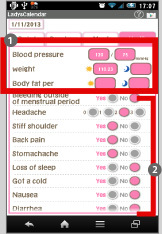 You can select whether you want to show the pill mark or not from Menu of the mobile phone. 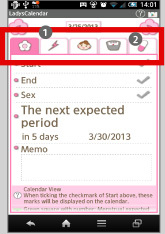 Tap Menu→select Setting→tick "mesicine icon" to show the mark, untick it to hide the mark. Added a new function "medicine name" in Setting. 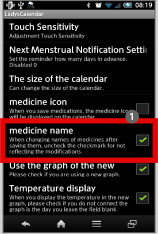 When changing names and contents of medicines after saving them, untick the checkmark for not reflecting the modifications to the past data. Added an average bar on the graphs (charts). Click QR cord below. The link to the Android market will be sent your mobile.Tap the QR cord if you visit our website with your mobile.